Unity is fast. 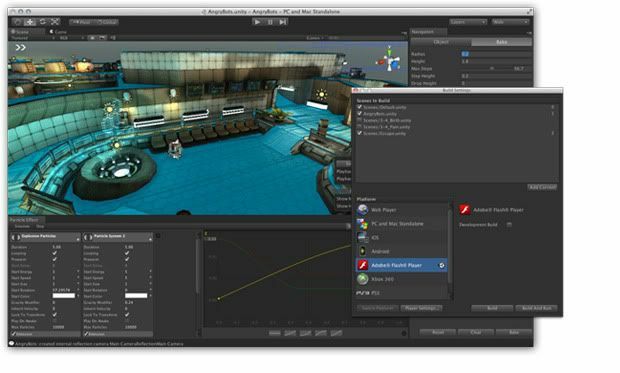 Unity 3.5 preview is available with exporting to Flash 3D/Stage3D available to test. Unity has been very quick to add this to their editor and platform. I wasn’t sure how much Flash 3D would get traction if not for UDK and Unity support, as they also work so well on mobile devices. As everyone knows there is an immense mobile disruption and Adobe recently pulled mobile Flash player support. It is possible this will be resurrected as just the Flash Player when/if mobile ever really supports plugins in browsers well, current hardware and technology may be too early – the plugin may have also gone the way of the app on mobile. There is always a need for advancement to standards though, html5 is largely influenced by Flash and others. I think there will always be a need for technologies that are innovating ahead of standards, which leads to better standards later. Plugins are yet to exist on mobile in a useful way in favor of native apps, due to mobile device hardware limitations in the current generation. There will probably always be a need of some plugins for web games and interactives. And here Unity and Flash have been strong in that area, coming together to tackle 3D and hardware rendering is a great match. Unity exporting to Flash Stage3D will provide a spark for the Flash Player 11 over WebGL as there is still some benefits to a proprietary solution to plugins currently. Internet Explorer is still holding out on WebGL and Flash 11 will be able to enter the IE moat. This export option allows another way to get your game on the web in a browser in addition to the Unity Player when exporting from the Unity tools. Game companies like Zynga, Playfish/EA, etc will probably be more apt to use the Flash 3D exported version rather than Unity Player only due to market saturation/penetration. I hope Unity Player support continues or possibly Unity gets bought by Flash and Unity becomes Flash. The integration could be good, but also bad for Unity if they don’t keep their player going so they don’t have to wait for the Flash Player standard from Adobe. There is an immense market waiting for hardware accelerated games in the browser even for 2D games from core to social games, all of them need to move lots of sprites, logic and game renders around that require performance. Unity to Flash 3D has a slight edge over WebGL in that is is a single player and compiled assets, and supported by the best 3D/2D/game/interactive editor out there in terms of production pipeline. Flash Player is still compiled and a bit faster than WebGL scripted but there is still limitations on what you can do without a compiled app to run; interpreted code still adds heavy weight and delays to the 33ms needed on each frame for 30fps. An example of performance using Box2D across native to scripted rendering. Unity has given us all a present to play with for the holidays, I am sure it will take some time to get right. But having this tool to iterate on and seeing what Flash 11 Stage3D can do as an export target will be fun. There is even a contest that you can enter over the holidays to win some prizes and the entries are judged by none other than UnitZeroOne aka Ralph Hauwert, as well as Lucas Meijer and Unity’s CEO David David Helgason. This entry was posted on Thursday, December 22nd, 2011 at 12:31 pm	and is filed under 3D ENGINES, TECHNOLOGY. You can follow any responses to this entry through the RSS 2.0 feed. Both comments and pings are currently closed. Very cool news. Out of curiosity which of the three languages do you write in? > … possibly Unity gets bought by Flash and Unity becomes Flash. ffs, I hope that never happens!